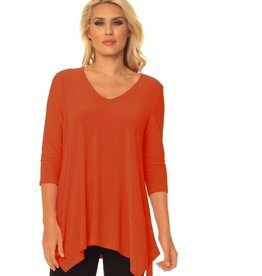 ALISHA D 3/4 SLEEVE, V-NECK, POINTED HEM TUNIC, HIGH PERFORMANCE JERSEY KNIT, FLATTERING, NO CLING, EASY FIT. OFFERS FULL COVERAGE AND VERSATILITY. WASHABLE. COMES IN A MULTITUDE OF RICH, NON FADING COLORS. A TRAVEL MUST AND A WARDROBE ESSENTIAL. TANK REVERSES FROM SCOOP NECK TO V-NECK. LONG LINED AND GENEROUS FIT. WASHABLE.